I came across this picture on Facebook today. It’s one of those that are hard to ignore isn’t it. 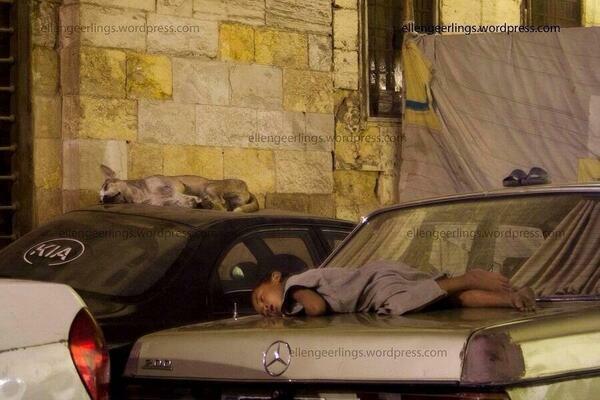 For a long time, every time I close my eyelids, I’m going to see that child in rags sleeping on the boot of a Mercedes car parallel to a stray dog sleeping on top of a Kia. But that’s for a few days and after that, like you, reader, the image will disappear as I get caught up in my own life, the worlds ups and downs and perhaps in it’s politics and natural disasters. That’s only normal. But there is something else that passes my mind when I look at this picture for a while. The story. I had never really thought of this before, but having stumbled on this photograph I realised how incredibly lucky the children I work with are. I cannot even believe I just typed that! The irony! But they are lucky, they are luckier than that child because they have, more than finding refuge, have found a listening ear to their story and a bridge for their voice. I look again at the picture and I see the slippers that are held in such high esteem they are placed at the highest point – even above the child him or herself, no doubt a valuable possession in the unforgiving harshness of the “street” that has become their first name – “Street Child”… I see the open mouth and wonder what words are escaping in those breaths and the crossed legs and because of my work with street children know that this child has had them forcibly uncrossed. All the stories told and untold in this one photograph will haunt me like those I have heard. The stories of those windows that look out on the child but have no space to embrace that childhood within it’s walls tell a million different stories. Why am I writing this? Because I realised there is something else that people can do to help these children, if not by taking them in, lobbying and campaigning for them, setting up alternatives for them, then at least to listen to them. Even if the children lie, their lies are often not as sadistic as the truths they hide, I learnt this at the shelter when Sarah was acting out for our entertainment how she begs and tells people that her father was killed and she had to take care of a disabled mother and 4 little brothers and sisters. It amazed me because her real story, that she ran away because her father used to pour boiling water over her body for her step mothers pleasure surely would move passers by more. But just to listen to the stories they want to tell and when there’s nothing but a picture like this one, then realise that there are stories wanting an understanding ear. Reblogged this on Poor as Folk.